Crockpot meals make life easy, and they just end up feeling like comfort food, which we are all about once the weather gets colder. 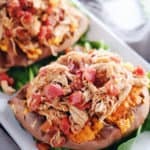 These crockpot maple chipotle chicken stuffed sweet potatoes are the perfect cold weather weeknight dinner. They are hearty, a little smoky and spicy-sweet. It’s such a tasty combo! This one is even better because it only takes about five minutes to prep and get your crockpot going, so it is super simple. 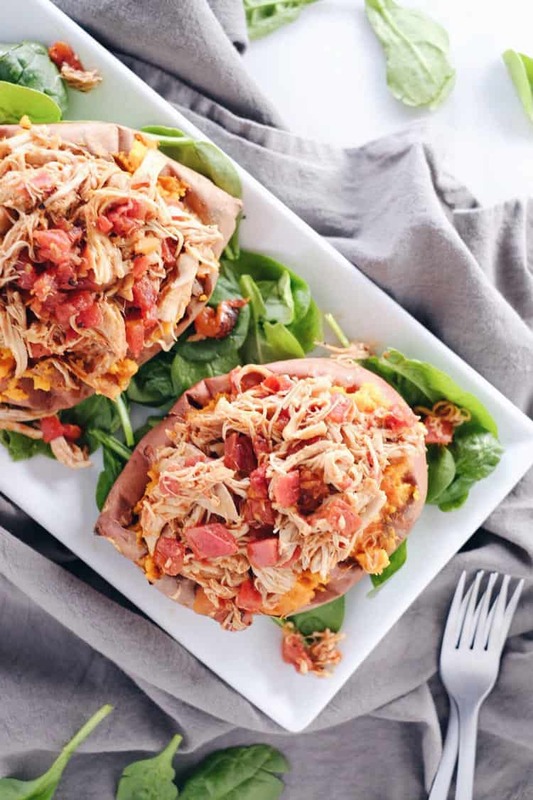 Then, all you have to do is let your crockpot do the work all day until about an hour before you are ready to have dinner, when you’ll want to get your sweet potatoes in the oven. About 45-60 minutes before you want to eat dinner, poke some holes in your sweet potatoes with a fork and place them in the oven. We’ve found they cook best when you simply place them directly on the rack in the oven. I know, you’re thinking what about the mess? They won’t drip a ton of gooey stuff but there may be a few drops, so here’s a trick. Line a cookie sheet with foil and place it on the bottom rack of your oven. Then, place the sweet potatoes directly on the top rack. Your foil-lined cookie sheet will catch any drippings and keep your oven clean! Can’t eat sweet potatoes like me? No problem, just roast a squash instead! 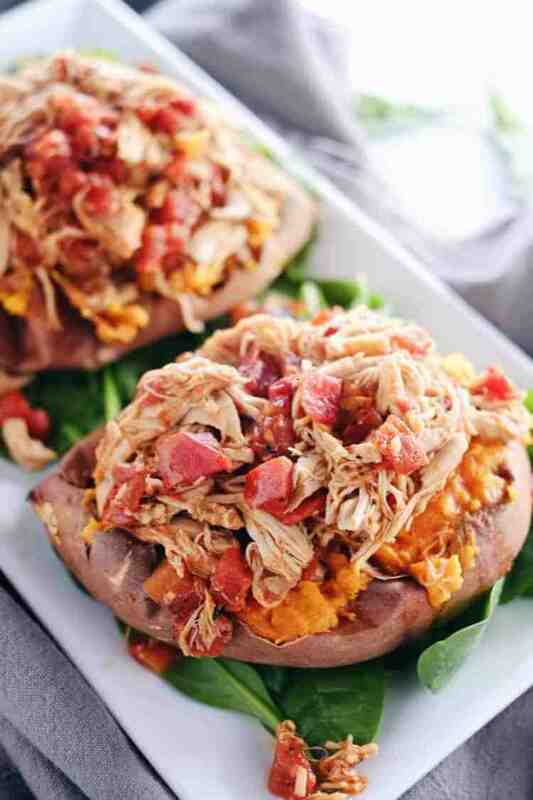 Get your slow cooker out and make these crockpot maple chipotle chicken stuffed sweet potatoes. They are sure to be a new family favorite! Let us know how it goes by leaving a comment below. Also, take a photo and tag us on Instagram @realsimplegood, so we can check it out! 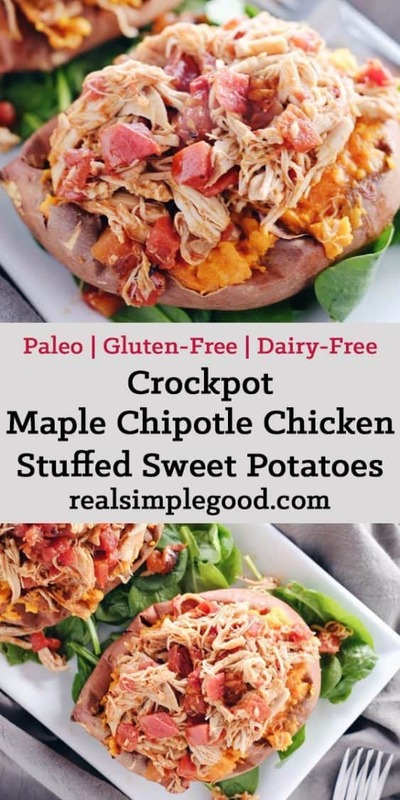 Place all of the ingredients in crockpot in order listed above, except for sweet potatoes and greens. Cook on low for 6 hours or on high for 3 hours. You can also cook this in your Instant Pot for 20 minutes. Preheat oven to 425 degrees fahrenheit. About 45-60 minutes before you want to eat, get the potatoes in the oven. Prick each potato with a fork a few times. Then, line a baking sheet with foil and place the baking sheet on the bottom rack (this is just to catch any juices from the sweet potatoes as they cook). Place sweet potatoes directly on the rack above the baking sheet. Cook for 45-60 minutes, until the potatoes are tender. While potatoes are cooking, shred chicken in crockpot with two forks. Let it soak up even more of the sauce while the potatoes finish. Once potatoes are tender, remove from oven and carefully slice in half lengthwise. Use a fork to mash the potato a bit. 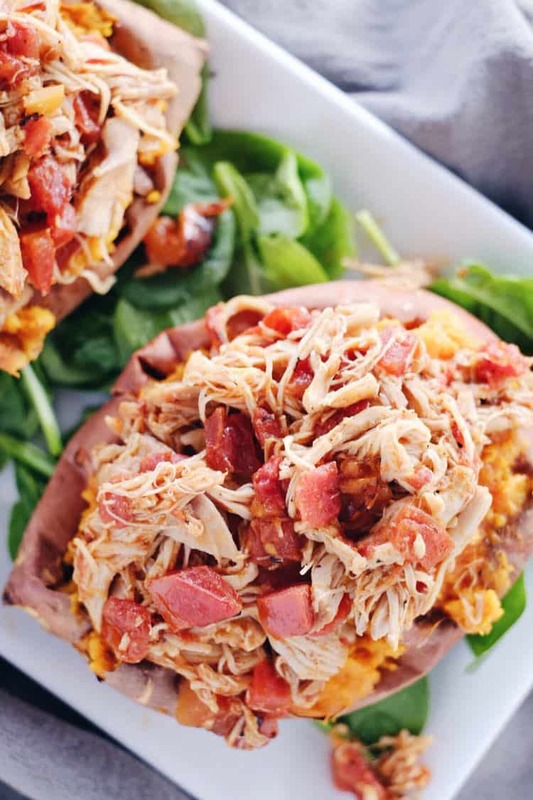 Scoop the shredded chicken mixture into the baked sweet potatoes and serve on a bed of greens.